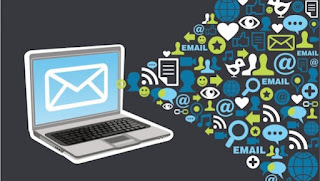 Sending out marketing emails regularly is a great way to keep your customers thinking about your business. The question is, what kind of emails should you send to help this effort? Good question. We’ve got the answers. Here are four emails you should send to stay relevant to your customers. Offer your readers educating, entertaining and valuable content in a newsletter. And, send it out on a regular basis so customers come to expect it. Your email newsletter can have a variety of information in it including anything from company news to upcoming events, but make sure its overall look is well-organized. Offer bite-sized pieces of information in a quick, easy-to-digest format. Videos are also a good addition to a newsletter, Liepelt says. This newsletter from Skin Perfect has a three-minute video of a business owner speaking at an event with information about another opportunity to meet the owner. Jordan Vineyard & Winery also includes a video in their monthly newsletters. The topics change every month, it could be an interview with wine maker, a talk about the harvest or their new wine app. When a holiday rolls around, send some e-love to your customers. From Thanksgiving to the first day of summer, you can use any holiday to send your customers some virtual cheer. Here’s an example. If you want, you can include a discount to entice your customers to do a little shopping on your site. Either way, the point of the holiday email is just to let your customers know that you’re thinking about them. When a customer signs up for your email list, keep track of the signup date and send an anniversary email a few months later. 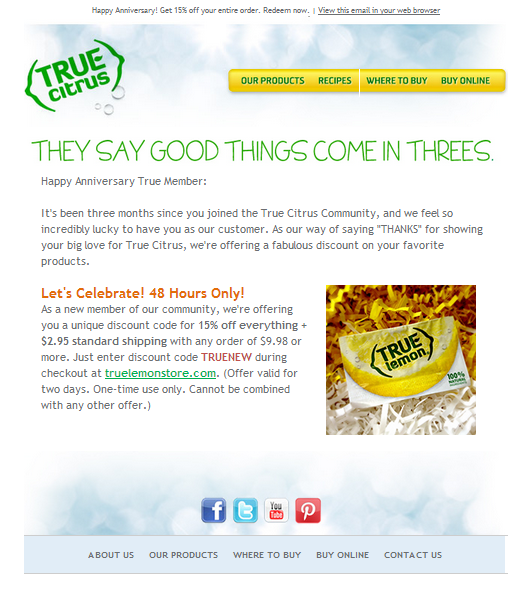 True Citrus, a company that sells flavored packets for water, has a good example. Three months into a customer’s subscription, the company sends an anniversary email along with a discount. Asking for feedback is an interactive way to stay top of mind with your customers. After a customer makes a purchase, send a thank you email and ask for feedback with an easy link. By knowing as much as possible about your customers, you can offer valuable content to help your customers. Here’s an example of an email asking for feedback from a local dentist. These four emails serve as a reminder to your customers that you’re ready to be of service. Through strategic emails, your business will remain top of mind, which will encourage your customers to keep coming back. Are you sending these four emails? Have any others you think are valuable?